Onboard computer – very convenient and useful device for cars VAZ. Installing it in the car, you will get many useful and convenient features that not only improve interior comfort, but will allow in all conditions to choose the optimum driving mode. 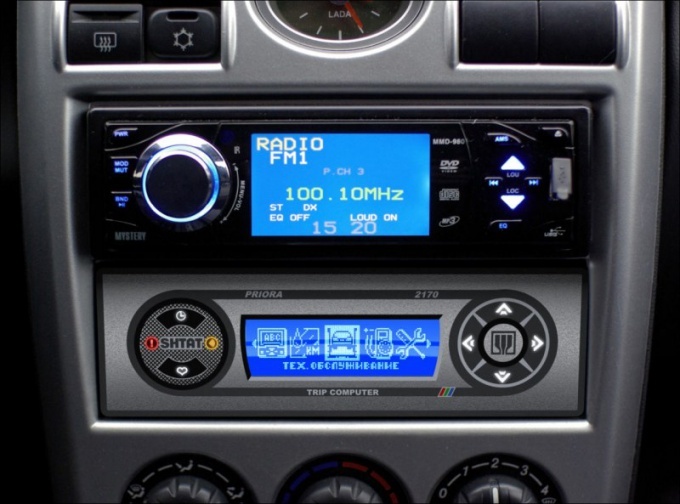 To install the computerand for cars Lada Kalina and Priora remove the radio from its installation space. Remove the cover marked with OPEN. In the rear wall of the compartment lid, drill a round hole with a diameter of 17 mm, or a rectangular size 17h10 mm cable. When drilling, be very careful not to damage any extraneous wires. Pass the cable of the onboard computerand through the resulting hole. Remove the screws on the compartment for small items. In a niche this compartment to install the adapter connection, pull the ribbon cable and secure the adapter by turning screws. Connector signal Flex cable plug into the connector located on the DLC. Install all previously removed parts and secure them with the regular mount. Put a removable panel on-Board computer. On front-wheel drive cars of the family Lada Samara and Lada Samara 2 install the onboard computer instead of the plugs on the console of the car. After removing the cover, locate in the niche of a standard 9-pin connector to connect the computers. Brown wire connect to socket M DLC (for machines € 2) or to the socket 7 (for Euro 3 cars). The other end of the brown wire will turn on in the socket 2 pads on-Board computer. The DLC located in the lower part of the instrument panel near the floor. The blue wire plug in the socket 4 PC. Internal temperature sensor output under the hood. On cars VAZ-2108-21099 additionally, perform the following connections. The white wire circuit fuel level sensor connect to 11-th contact pads of the instrument cluster or the wire is pink with a red stripe. Orange wire to 2nd contact pads of the ECU (under the trim near the driver's left foot). Pink wire – 3rd contact of the same pad. On cars VAZ-2110-2112 install the onboard computer instead of hours or dashboard. to do this, remove your watch and guide the installation process by analogy with paragraphs 4 and 5. Temperature sensor install in the front bumper so that it was protected from dirt, water, snow and air flow. Secure with PVC tape. On cars VAZ of issue until 2001, often missing the wire from the fuel level sensor. In this situation, connect the 8th pin of the connector computerand wire pink 10-th contact pads of the red cluster. For all types of car and computers: yellow, red and black wires are used to power the onboard computer. Yellow plug to the grey wire of the ignition switch. Red – to the brown wire of the castle or to the positive terminal of the battery. Black ground wire – to car body or to the 6-th contact pads of the red cluster.